We recently updated the safe cycle routes to schools project page. Shown as route 1 on the map below. Route now open. Hampshire County Council completed it in spring 2013. All feedback has been positive, which is very encouraging, especially as Hayling residents are renowned for voicing concerns! Shown as route 2 on the map below. The landowner has given approval for a permissive route, but a “pinch point” is the main factor preventing go-ahead from Hampshire County Council. 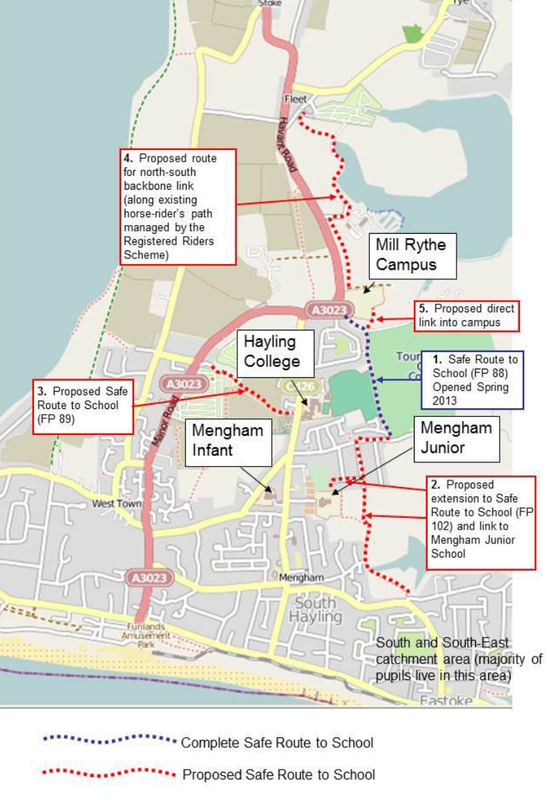 Cycle Hayling is discussing alternative options with HCC (e.g. short “dismount” section). Shown as route 3 on the map below. The land is owned by Parkdean Holiday Park. The site manager has given agreement to the path, but we are awaiting final go-ahead from the chief executive. Havant Borough Council is hoping to implement this route in 2014 if funds allow. Shown as route 4 on the map below. The landowner of southern section has given agreement. The northern section still requires approval from Registered Riders Scheme (RRS) and relevant landowners. The RRS are unwilling to share this limited section of their existing routes. Having tried for some time, we have finally managed to open discussions with the RRS, but it is clear there is considerable opposition from RRS leaders to sharing the footpath. We are trying to address their concerns, because this appears to be the only feasible option for providing a safe north-south link. Havant Borough Council shares this view. Shown as route 5 on the map below. The main landowner (Hayling Island Builders Ltd) has given formal agreement to the link, provided they don’t incur any cost. The land is currently leased to A.D. Walter Ltd (a farm), which has been contacted by Cycle Hayling. Active involvement by both Mill Rythe Headteachers and the Hampshire County Council Travel Team, which has adopted the project. Site visit already carried out by Hants Principal Engineer. Feasibility study by Hampshire County Council will begin once legal clearance has been obtained. £10k is potentially available for this project from Living Streets to spend straight away. Total cost may be more than £10k however, so we may need additional funding from Havant Borough Council. This map shows all the above routes and how they link the schools together. Click the image to see more detail. Just to say we have used the off-road route from Tournerberry Road to Mill Rythe several times in the past fortnight. Before we knew about it, we had to brave the main road and it has made cycling that part of the north-south route on that side of the island a real pleasure. All power to your drive to get the final linkage connected from Mill Rythe norhwards. Thanks for all you do for us. Next PostNext Money for local cycle projects!